The National Center for State Courts (NCSC) and the Chief Justice partnered together to deliver a Written and Oral Judgments Workshop for approximately 50 Supreme and Appeals Court Judges, Registrars, and Magistrates January 8-9 in Nassau. The workshop was funded by the U.S. Embassy’s International Narcotics and Law Enforcement Affairs (INL) Section through the Caribbean Basin Security Initiative (CBSI) and was part of ongoing U.S.-Bahamian cooperative efforts to increase efficiencies in the administration of justice in The Bahamas. The two-day program was designed to enhance attendees’ ability to communicate principled and sound decisions to litigants, lawyers, citizens, and other courts. The interactive, peer-to-peer workshop was facilitated by a team of five U.S. experts that included trial and appellate judges and a Senior NCSC Program Manager. The visiting NCSC team provided best practices in rendering clear, concise, and timely judgments based on critical thinking and framed in language that fosters public trust in and understanding of the judiciary. In addition, workshop participants received a variety of materials including checklists, bench surveys, and example court orders. The judiciary hosted a series of stakeholder discussions in advance of the workshop, laying the groundwork for a successful event. 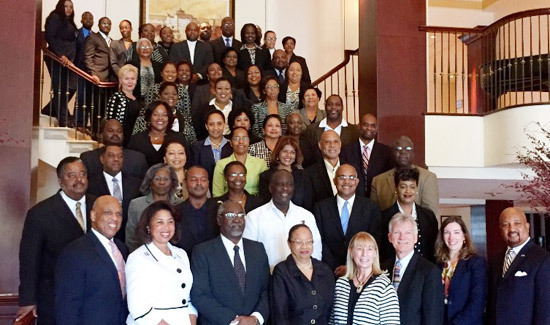 Caption: Chief Justice Sir Hartman Longley with Supreme and Appeals Court Judges, Registrars, and Magistrates and United States officials from the National Center for State Courts who facilitated a written and oral judgments workshop January 8-9 in Nassau. The workshop was funded by the U.S. Embassy’s International Narcotics and Law Enforcement Affairs (INL) Section through the Caribbean Basin Security Initiative (CBSI).